Sitting on the edge of the latest technology is where we like to be with our gear! The soul of our rig…. 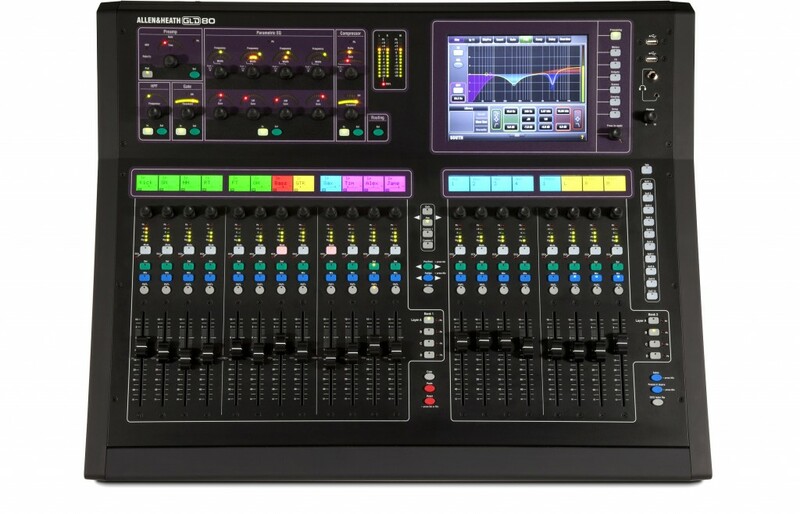 the Allen & Heath GLD80 with up to 48 channel inputs, 24 fold back / in-ear aux channels, incredible sounding pre-amps and simply beautiful control make this really a desk that we can use to maximum effect for your event. Have an iPad?? Then why not download the GLD OneMix app and setup your iPad as your own personal in-ear monitor mixer when we mix FOH for you! For Bands we pair it up with a full Martin Audio & Lab Gruppen, Sonifex & Sennheiser In-Ear Monitoring rig, we can tailor a package for your band or events audio requirements with ease. Even if you just need a two speaker PA and a mic?? CALL US! Corporate Audio & Visual solutions?? Need plasmas or projection?? Need Speakers on sticks?? Need radio mics?? Nothing is too small for us to cater for, and at competitive pricing and operating at the most professional level possible, we offer a service that is pretty much unrivalable! We believe in added value by service – so you pay a competitive price – but get all the trimmings of unbelievable service!